Despite being a relatively-boring slate appearance-wise, week 13 was wonky, with a number of underdogs winning outright (and one 14-point favorite costing their coach his job). 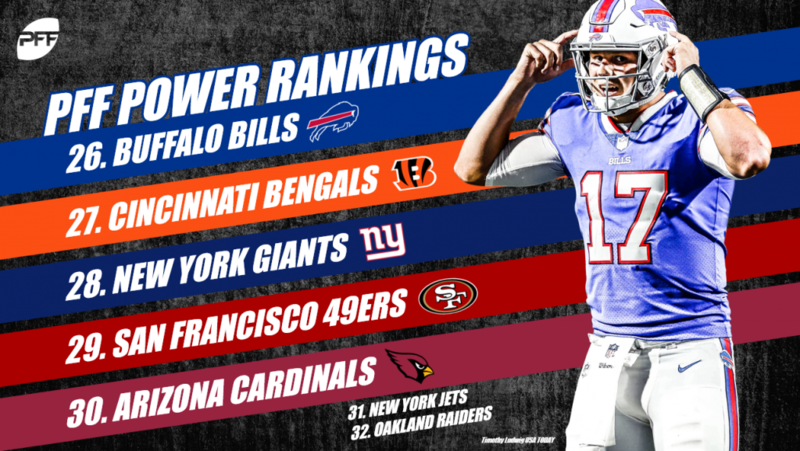 We see a little bit of a shakeup in the top six of our rankings going into week 14, making what appears to be a better slate even more compelling in terms of playoff seeding moving forward. The Saints stumbled on Thursday night football, losing to the Cowboys and dropping almost 30 PFFELO points in our ratings. Most concerning was their complete lack of offensive output, as Drew Brees was under pressure on 11 of his 30 dropbacks. 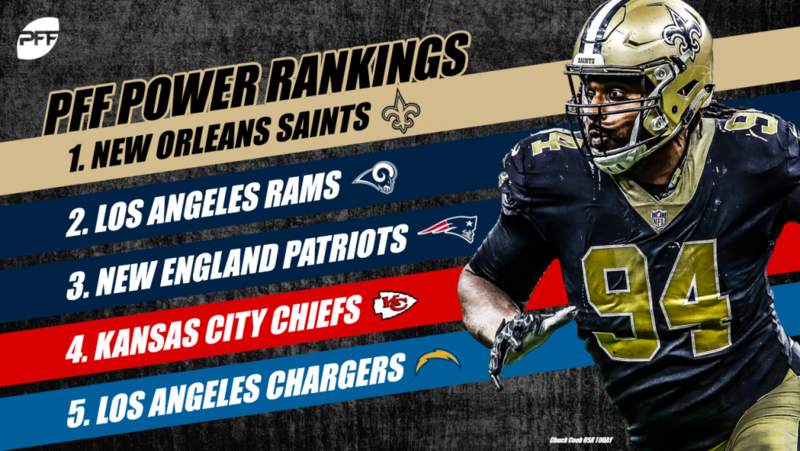 The Saints and Drew Brees haven’t played that poorly offensively since 2016, still, as the clear number one in our model, this appears to be much more of a blip than any sort of growing concern out of New Orleans. The Rams are the clear number two in our ratings, sitting almost 35 points above the Patriots. The Rams ran away from the Lions on Sunday with Todd Gurley generating 3.57 yards after contact with four avoided tackles. Defensively, it doesn’t get much better than the 17 pressures registered with four sacks and a forced interception. They have a tough Sunday night matchup against the Bears which, if they win, will all but guarantee a number one seed in the NFC playoff race. The Patriots completely shut down the Vikings’ passing attack and limited Kirk Cousins to an average depth of completion of just 3.1 yards. They have the second-best EPA allowed on early-down pass plays in the AFC, so if the coverage unit continues to play this well, Tom Brady and Belichick will be tough to beat come playoff time. The Chiefs are capable of making any game (even a game against the Raiders) entertaining, but this game wasn’t as close as the final score of 40-33 indicates. Travis Kelce was simply perfect with a 158.3 passer rating when targeted. Patrick Mahomes has now tied Drew Brees for the top player in our WAR metric at 6.22. The Chiefs are sitting at almost exactly a 50% chance of home field advantage come January. The Chargers pulled out a stunner on the road, gaining 25 PFFELO points and leapfrogging the Steelers in our rankings. Not many thought it was possible, but at age 36, Philip Rivers somehow is playing the best football of his career, posting the league’s fourth-most WAR at 4.55. Projecting 11.5 wins for the Chargers, our model has them at 96% chance of making the playoffs and an 11.5% chance at a first-round bye. The Steelers failed to take care of the Chargers at home with Big Ben Roethlisberger crumbling under 12 registered pressures. In contrast to Rivers, Big Ben seems to be having one of the worst seasons of his career and has posted his lowest average depth of target since PFF began grading games in 2006. He has the 20th-best WAR among starting quarterbacks. 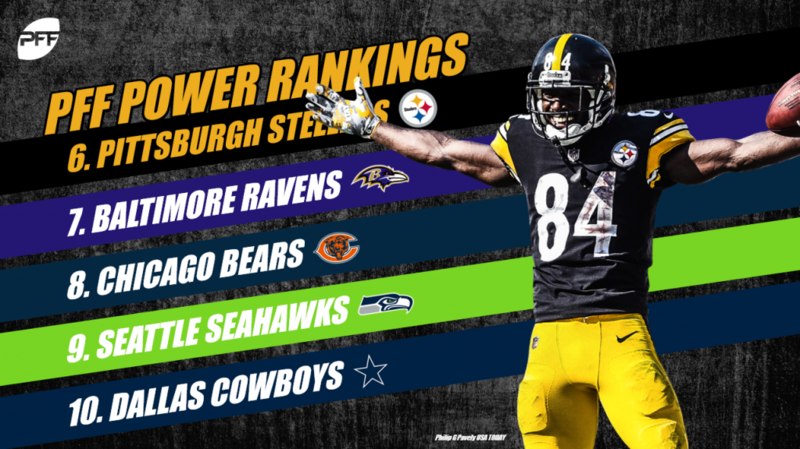 The Steelers are all but locked into the AFC North at an 89% chance, but what they are capable of doing in the playoffs will be determined directly by the play of Ben Roethlisberger. 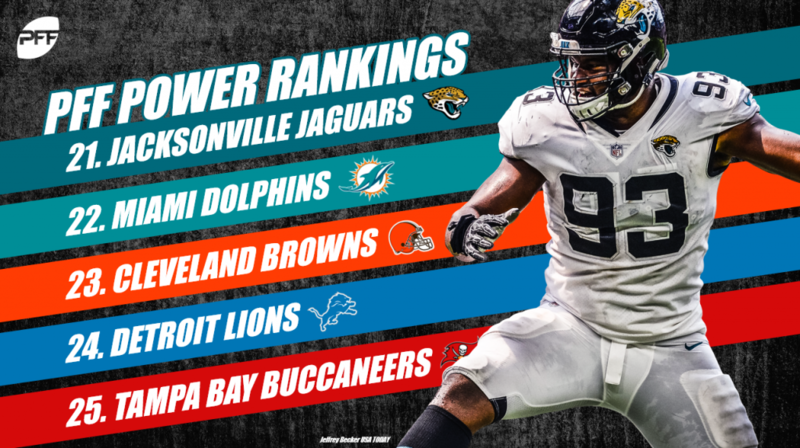 The Ravens have hit on the recipe for midseason success with Lamar Jackson off to an impressive start and the defense continuing to play like the best unit in the league. On pass plays when pressure isn’t registered, the Ravens have allowed the lowest passer rating in the league and have contested passes at the highest rate in the league. However, they have a tough remaining schedule and only an 11% chance at taking the AFC North. Chicago rallied late but couldn’t pull off the overtime victory against the Giants. Chase Daniel lost the magic he displayed on Thanksgiving and has Bears fans anxious to get Mitchell Trubisky back for their matchup against the Rams this Sunday night. With the Giants lighting this defense up, there should be plenty of concern about them being able to slow down Sean McVay, Jared Goff and another generational talent at running back. Russell Wilson’s inspired performance continued on Sunday, as he threw three touchdowns on his first four pass attempts. Wilson has Seattle at an 81% chance of the playoffs and is a scary wild-card matchup for the winner of either the NFC East or North. The Wilson to Tyler Lockett connection continues to be perfect and has yielded a passer rating of 158.3 and a catch rate of 86.3%. The Cowboys saw the second-biggest increase in PFFELO ratings for week 13. The ‘Boys have the third-lowest EPA allowed on early down pass attempts in the NFC as their defense continues to play well at home. 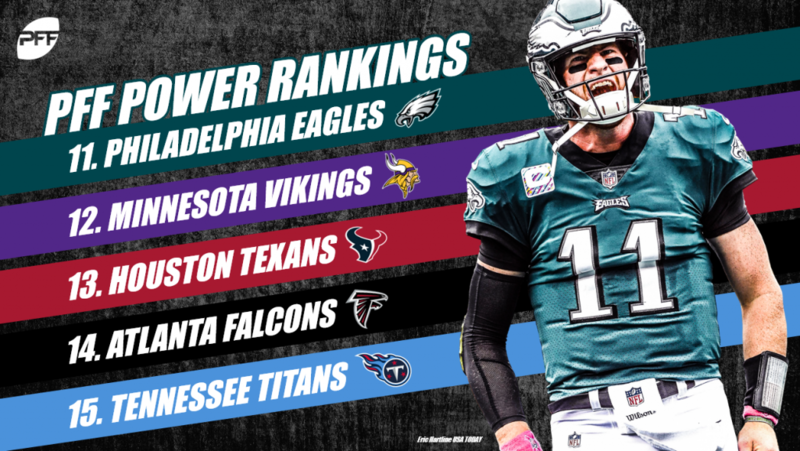 They now sit at 68% chance of winning the NFC East and a 77% chance of making the playoffs with a division matchup against the Eagles looming. The Eagles handled the Mark Sanchez led Washington Redskins on Monday Night Football. They now have a must-win game on the road against the Cowboys to keep their division and playoff hopes alive. Carson Wentz has had much more success throwing underneath in the Eagles past two victories. The Cowboys defense hasn’t allowed many yards after the catch so if the Eagles cannot get the underneath passing game going, their best hope is a long defensive struggle on Sunday. The Vikings played in a daze on Sunday as their offense was never able to get going in Foxboro. Kirk Cousins was signed for moments like this and Vikings fans hope this was only a minor blip and not a growing trend. At almost an 86% chance at making the playoffs, Kirk Cousins and the offense will have more opportunities to perform in big spots. Everything appears to be coming together for Bill O’Brien down in Houston. Deshaun Watson is having success in a much more sustainable way than he did in 2017. The Texans defense has the second-best allowed rushing success and the third-best passing success in the AFC. They are a virtual lock to win the AFC South and have around a 25% chance at a first-round bye. At 4-8, Atlanta is a hot mess and one of the biggest disappointments of 2018. In some losses, they have let close ones slip away, but the Falcons had their worst performance of 2018 at home on Sunday. Matt Ryan was pressured on 13 of his 30 dropbacks but even more alarming is how poorly he was when not pressured, as he posted a passer rating of just 73.2 from a clean pocket. Atlanta’s pass defense has allowed 0.14 EPA on early-down pass attempts and the worst rushing EPA in the league. The Falcons offense isn’t playing well enough to keep pace with quality teams. This is the most enigmatic team in the NFL, bar none. Within the last month, they’ve handily beaten New England, failed to cover a large spread at home to the Jets and have got blown out by Houston and Indianapolis on the road. Their path to the playoffs is a bumpy one (just an 11% chance) but could be elevated by an increase in Marcus Mariota’s play – play that has yielded just 0.02 EPA per dropback so far this year. When the Panthers were 6-2, they were only a few advantageous sequences away from being 4-4. 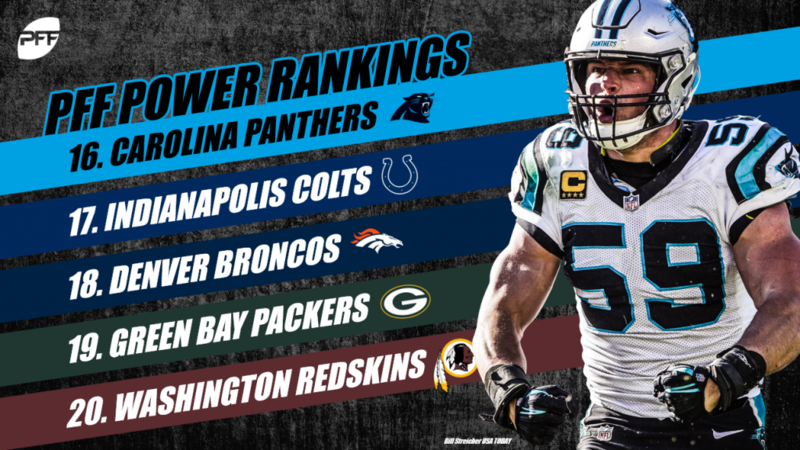 Those seem to have come back on Carolina, exposing what has been a pretty bad defense all year. Only Detroit and Tampa Bay (two teams that have beaten the Panthers over the last three weeks) have been worse defending early-down passes than the Panthers in the NFC, while Oakland is the only AFC team that is weaker. They play the Saints two times in the next four games, along with an upstart Cleveland team and an Atlanta squad with a good offense. 6-2 to 6-10 is rare, but could easily be done here. As emerging teams often do, the Colts faltered in their attempt to catch the 9-3 Houston Texans and got shut out 6-0 in Jacksonville. Their playoff hopes are not particularly high given such an outcome (about 12%), but if Andrew Luck can continue to generate positively-graded throws on over 27% of his dropbacks, there’s certainly a chance that last Sunday was just a hiccup and the Colts could propel themselves back into the conversation. Denver is surging, very much because of their ground game which is averaging 0.06 EPA per early-down run play. This is difficult to sustain long-term, but if they can keep it going for the next month, there’s a chance (about 11%) that Case Keenum can take his team to the playoffs for the second consecutive year. Mike McCarthy is out, Joe Philbin is (still) in. Despite Aaron Rodgers possessing a top-five PFF grade in the league among quarterbacks, the Packers offense has been successful on just 49% of their early-down passing plays, which is simply middle of the pack in what has been an underachieving NFC. With this season (there’s just a 1% chance to make the playoffs) likely a lost cause, it will be interesting to see if this change has any real tangible benefit now. Just a few short weeks ago Washington was 6-3 and looking like the favorite to win the NFC East. Now, with Mark Sanchez under center, an 8-8 season looks like a less than 50/50 proposition, let alone a playoff berth (just 27.5%). The Jaguars showed you the blueprint for their possible success Sunday at home against the Colts – shutting out a surging Indianapolis team and managing to win with Cody Kessler at quarterback. They also showed you why (unless they get a quarterback that can consistently be in the upper half of the league) they will be so maddening for the foreseeable future – as defense is an unstable means by which to win in this league in the long term. The one team in the bottom 12 that actually has a chance to make the postseason, the 6-6 Dolphins have roughly a 10.4% chance to make the playoffs. While they have won with Ryan Tannehill at the helm, he hasn’t been good, generating turnover-worthy plays on over 7% of his dropbacks this season, “good” for worst among qualifying players at the position. The Browns were the Browns for portions of their game against Houston, with Baker Mayfield throwing three clean-pocket interceptions despite averaging over nine yards per pass attempt against the upstart Texans. We have the Browns finishing with 5.8 wins by the time it’s all said and done, almost perfectly meeting Vegas’ expectations for them pre-season. The Lions were unable not only to win but to cover as double-digit underdogs at home to a Rams team that was 1-10 throwing the ball under pressure. Unfortunately for Detroit, Matthew Stafford was under pressure on almost half of his dropbacks himself, with both starting guards allowing a sack, at least one quarterback hit and three hurries each. This week in Arizona will be interesting from a motivational standpoint for the Kitties. The Bucs are one of the more efficient offenses in the league in the passing game, generating success on almost 54% of early-down plays. Jameis Winston has graded positively on over 35% of his passes so far this year, the highest mark among quarterbacks. If he can limit his turnover-worthy dropbacks (over 6%), this offense could be scary for the season’s last month. The Bills were competitive again in a tough AFC East matchup, ultimately losing to the Dolphins on a missed field goal and a missed, wide-open, Charles Clay in the end zone on fourth down with the clock winding. Josh Allen has been dynamite as a runner the last two weeks, generating 100 yards in each game (210 total on scrambles alone) and giving the offense a chance with what is otherwise a limited stockpile of talent. The Bengals not getting over the 5.5 win total we posted pre-draft would be one of the worst beats in a season full of them. The Bengals are the only team in the NFL that is allowing a positive EPA on both early-down passing and rushing plays, which makes life very difficult for Jeff Driskel and a banged-up offense moving forward. Saquon Barkley has been as good as advertised and is the second-most-valuable running back in the NFL through the season’s first 13 weeks. It hasn’t translated to wins in the standings, but it has been an encouraging month for the G-Men, with edge defender Olivier Vernon generating 14 total pressures over the last three games (with the Giants posting a 3-1 record over that span). The ‘Niners continue to play hard, but continue to keep themselves in the running for the first-overall pick. Their most-valuable player this season, George Kittle, is leading all non-running backs in yards per reception after the catch (567) and appears to be a cornerstone for an offense with a lot of potential moving forward. The Cardinals were able to win as 14-point dogs in Green Bay, despite allowing quarterback Josh Rosen to face pressure on almost half of his dropbacks. He’s been worth almost a win below replacement so far this year, showing the substantial value that can be prevalent if he figures it out moving forward. The Jets made the bet that numerous three-point scoring plays would be enough to overcome multiple seven-point scoring plays — bold move, cotton. Ultimately, this has been a disappointing year for the Jets, who have managed three wins despite playing the 26th-most-difficult schedule according to PFFELO. It’s been a rough year for the Raiders, although they covered the spread last week against an elite Kansas City team at home. Their most-valuable non-quarterback through the season’s first 13 weeks has been Jared Cook, adding almost half of a win above replacement.